I’m super excited today! 1) Because its December and the holidays always make me a super excited person. 2) Because I’m getting to spend a whole day just working on blog things and getting caught up. 3) Because all my Black Friday and Cyber Monday polishes are rollllling in. 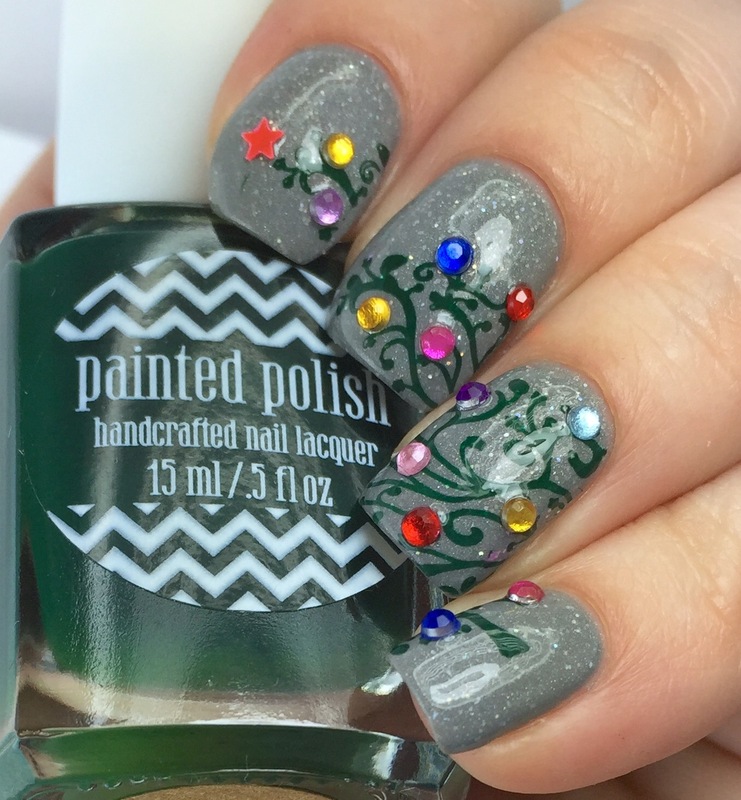 4) Because I’m determined to participate in a holiday nail art challenge and this is my first link-up! 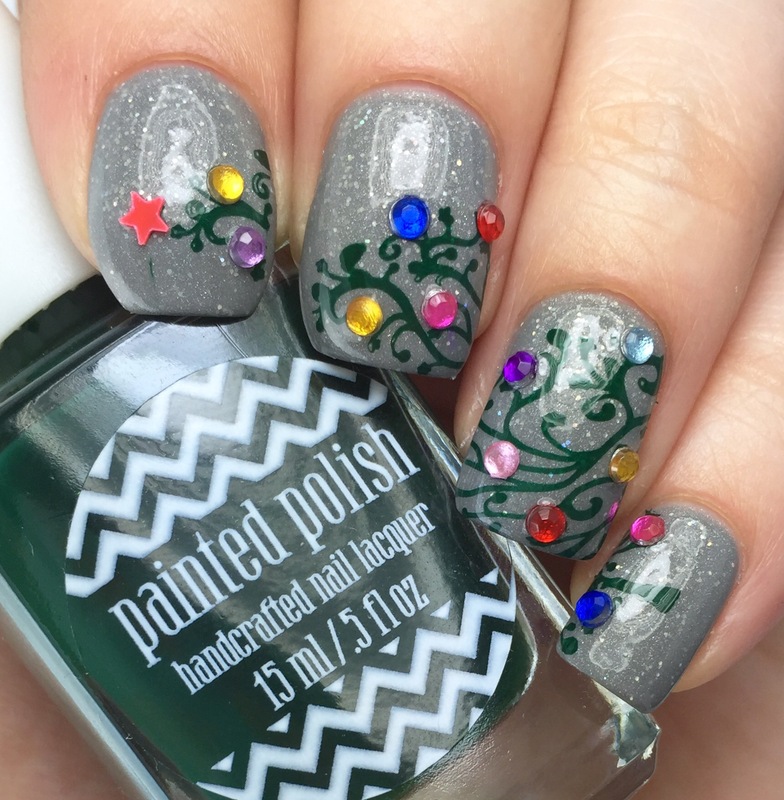 This is my contribution to Challenge Your Nail Art’s 12 Days of Christmas Nail Art Challenge. The prompt was “Christmas Trees,” but since I have a problem following instructions, I only did a single tree. But I still like it! I started off with a base of Model City Polish’s “Wrapped in Wool,” a holo-glitter-laden gray polish. 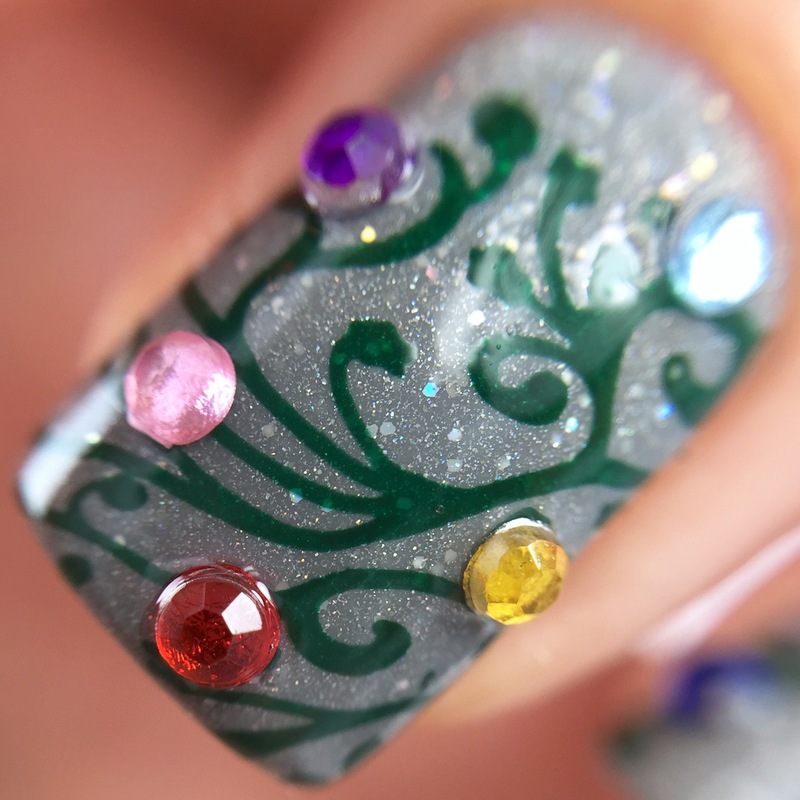 Then, I used Painted Polish by Lexi’s “Woodland Whimsy” (reviewed here– I knew it would stamp like a champ!) 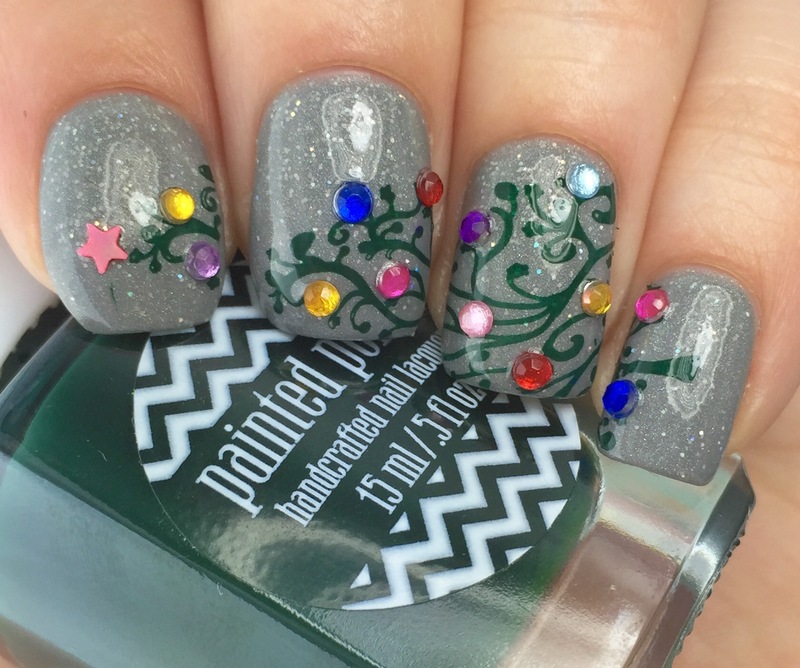 and Uber Chic’s Christmas plate to stamp a large tree design sideways across my nails. Then, I capped it off with Love Angeline’s new top coat, “Topped With Love,” which is becoming my new favorite top coat with all this nail art that I’m up to. In all honesty, I am really excited about participating in this challenge. I am pretty thrilled with how this turned out, and having a blast seeing what everyone else cones up with. It is hard for me to get new nail art looks every other day, but I’m trying not to get too behind! I have a hard time following directions too. 😛 I really adore how you did this, from the base to the gems for ornaments, it just looks great! Haha- my biggest directions struggle is for cooking. I’m always going off-recipe! Thank you! 🙂 I had so much fun placing the rhinestones! I loved this polish so much that I had to go back and buy the rest of the collection! This was my first Model City Polish and I LOVE it! Thank you so much! 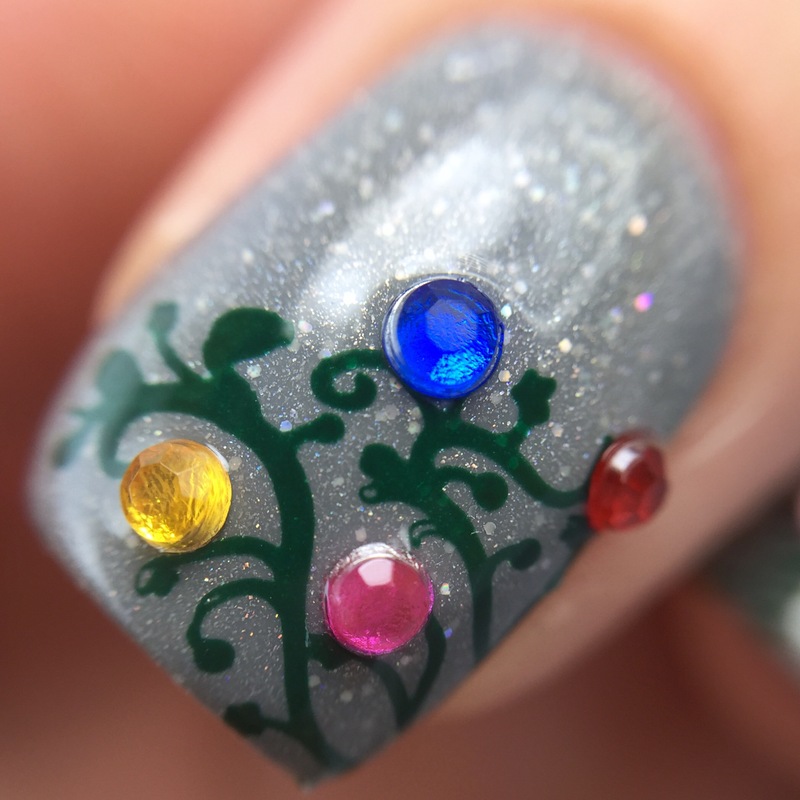 This mani is plain gorgeous! I love the base colour, the trees and all the lights! Oh my, this is so fun! I love it!